Lola is fab-u-lous! She's a budding fashion designer with a flare for living within her costume outfits. She's bold, she's sassy and not afraid to express herself through her quirky fashion sense. She's a devoted daughter with two fathers, after her mother couldn't care for her. She has a older boyfriend who's in a band, in which her dad's don't approve of, an awesome Nancy Drew wannabe friend and works with Anna (from Anna and the French Kiss). Her life wasn't always so fabulous. Cricket Bell, the lanky and equally quirky, boy next door broke her heart. 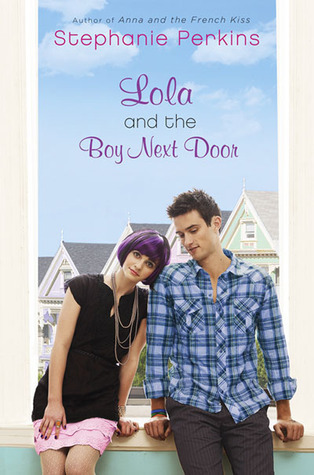 An overprotective sister, moving houses and his inability to tell Lola how he felt, ultimately drove them apart. She hasn't seen him since. She tries not to think about him, those blue eyes, his crazy inventions and how he was proud to call her his best friend. Lola has always marched to the beat of her own drum, her father's dubbing her their 'little drag queen', and Cricket had always marched along beside her. When she releases she has new neighbours, Lola panics. Surely it isn't... Phew. False alarm. Lola soon releases that Cricket isn't the same boy anymore. He's... tall. She knows he still stirs those feelings inside her, but with a jealous boyfriend, a mother back on the scene and Cricket's overprotective twin sister, can she handle being friends with the boy she once loved? Stephanie Perkins is the queen of light and fluffy teen romances. They are fun, flirty and the characters she creates are quirky and full of life. I quite enjoyed how the story included both Anna and St Clair from her first novel, and intertwined them throughout Lola and Cricket's story. If your looking for a light, feel good read, you can't go past Stephanie Perkins.